Looking for a Genesis framework theme to represent your local church community online? This third in our Spire WordPress church theme is the perfect option. 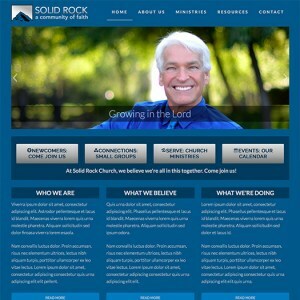 With professional design appeal and user-friendly administration, this is a premium church theme that does it all. With a built-in sermon organizer, slideshow, and full admin options panel, you'll be able to customize this for your local congregation simply and quickly. Included with your WordPress theme purchase is the full live demo install. That means that with a few clicks you'll have a site up and running that looks and functions exactly like our live demo. So if you want a church theme that is striking to behold, and simple to manage, why not choose this new Genesis framework WordPress church theme from CMSTF? It's the ultimate in affordability and professionalism.